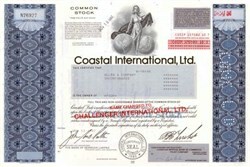 Beautifully engraved certificate from the Coastal International, Ltd. issued in the 1980's. This historic document was printed by the American Banknote Company and has an ornate border around it with a vignette of an allegorical woman between two glones. This item has the printed signatures of the Company’s President and Vice President and Secretary and is over 12 years old. Intelect Communications, Inc. was incorporated in Delaware on May 23, 1995. The Company’s predecessor, Intelect Communications Systems Limited (“Intelect (Bermuda)”) was incorporated under the laws of Bermuda in April 1980 and operated under the name Coastal International, Ltd. until September 1985 and as Challenger International Ltd. until December 1995. 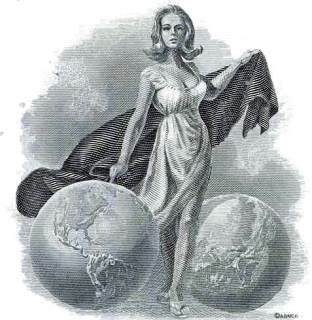 On December 4, 1997, the shareholders of Intelect (Bermuda) approved a merger proposal, the principal effect of which was to change the domicile of Intelect (Bermuda) so that it became a publicly traded United States-domiciled, Delaware corporation. The effect of the merger was that the shareholders of Intelect (Bermuda) became shareholders of the Company with the Company becoming the publicly traded company. In addition, the Company became the holding company for Intelect (Bermuda) and replaced Intelect (Bermuda) as the holding company for its subsidiaries. The merger was effected on December 4, 1997. The Company is primarily engaged in the business of designing, developing, manufacturing, marketing and selling optical networking equipment. In addition, the Company provides engineering design services to other telecommunications companies and designs and sells digital signal processing products. The Company’s current operations were established through a series of mergers in 1995 and 1996. The Company’s operations are conducted primarily through two wholly-owned subsidiaries, Intelect Network Technologies Company (“INT”) and DNA Enterprises, Inc. (“DNA”). The Company is strategically focusing its product lines and services to take advantage of the convergence of voice, data and video telecommunications services. This convergence is being driven by the explosive growth of Internet applications such as E-commerce, which is accelerating the expansion of network capacities. These industry trends create requirements for today’s network integrators and directors to manage multiple applications, at multiple locations, within bandwidth resources and while balancing the need for network reliability. The Company’s product lines are designed to meet these evolving markets, applications and requirements. The Company’s objective is to develop and bring to market a new generation of intelligent, flexible, and scalable communications products designed to combine current voice, data and video networks (for example, telephones, computers, surveillance) into a single communications network, which would also upgrade communications into the latest generation of high-speed technologies, while using a single network management system.